No one is allowed to train without applying for Wu Shu Kwan membership because (in Great Britain, for example) it includes insurance cover in case of personal injuries in training. Our injury-free record is excellent, but it is the general policy of any governing sports body to encourage all responsible martial art organisations to have their members covered by a recommended insurance policy. Applicants should apply for their Wu Shu Kwan membership on or before their first training session. You can enrol with the instructor at any of our classes, or apply to the Wu Shu Kwan office. When ready, a membership card together with a receipt and other documents will be issued, and they can be collected by the member from the instructor. If they are to be returned by post, a self-addressed and stamped envelope (SAE) of A5 size has to be provided. * A photograph is necessary for identification purposes because many people have the same name, for instance, John Smith, David Williams, etc. If a photograph is not available at the time of application, it can be accepted later. But do make sure that your photograph is given to us with your name written clearly on the back to avoid confusion. £9 per session (about 2 hours) – payable only when you train. Please enquire with respective instructor in that country. Since you have made up your mind to go to a Wu Shu Kwan class to train, the easiest and most convenient way to enrol is to see the instructor there. He or she will be able to help you to complete the paperwork and handle your application for you. Also, if you have any last-minute questions, the instructor will be happy to answer them. 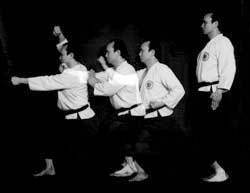 Grand Master C. K. Chang (8th Degree Black Belt) showing a series of Wu Shu Kwan movements in a multi-image picture. 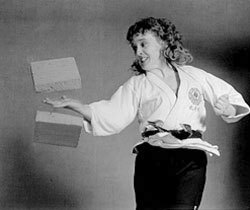 Trish Chang (7th Degree Black Belt), a Senior Master Instructress and a Guinness World Recorder holder, slicing a building block suspended in the air. Perfect technique, great speed and tremendous power are essential to succeed at such breaking. 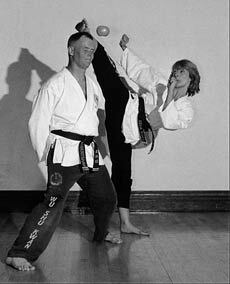 Celia Sisman (5th Degree Black Belt), a Senior Master Instructress, kicking an apple off her younger brother Mark Robertshaw's head. Despite his sister's great expertise, Mark still has a worried look on his face. 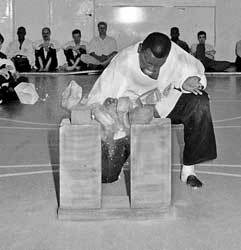 Tony Rocastle (5th Degree Black Belt), a Senior Master, is one of the few experts in the world who can break three bricks with one mighty chop. His chop is so powerful that it sends the broken bricks flying. Celia Sisman (5th Degree Black Belt), a Senior Master Instructress, showing incredible flexibility achieved through Wu Shu Kwan's scientific training. 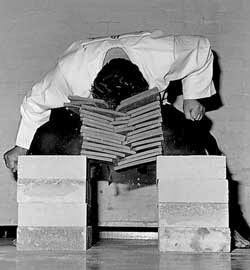 Patrick Maher (3rd Degree Black Belt), a Senior Master, breaking a stack of fifteen roofing tiles with his head. His martial art prowess is legendary. 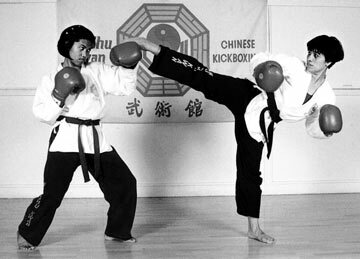 Evelyn Ingleton (5th Degree Black Belt) (right), a Senior Master Instructress, sparring with her sister Vanessa Peralta. Lee Johnson (USA) practising her self-defence technique with a training partner. Phil Hames (5th Degree Black Belt) (right) and Amit Roychoudhury (5th Degree Black Belt), both Senior Masters, are super-fit martial artists who have acquired extreme level of power and agility through Wu Shu Kwan training. They are seen here attacking each other with flying kicks. Dr Ronald Noel (5th Degree Black Belt) splitting an apple in the air that requires extreme speed and precision. 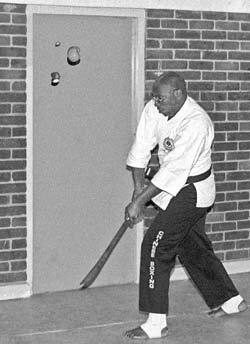 He is the chief instructor of Trinidad & Tobago Wu Shu Kwan.